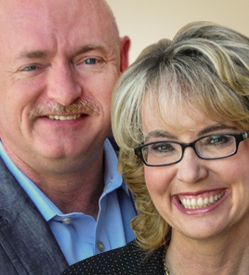 As individuals, Congresswoman Gabrielle “Gabby” Giffords and her husband, astronaut and former U.S. Naval combat aviator Mark Kelly, showed Americans how optimism, an adventurous spirit, and a call to service can help change the world. As a couple, they became a national example of the healing power to be found in deeply shared love and courage. Their arrival in the world spotlight came under the worst of circumstances. On January 8, 2011, while meeting with her constituents in Tucson, Arizona, Gabby was the victim of an assassination attempt. Gabby was shot in the head and; doctors called her survival “miraculous.” As the nation grieved and sought to understand the attack, Gabby remained in private, focused on her against-all-odds recovery. Giffords was a Democratic Congresswoman elected from Arizona’s 8th District. She served from 2007 until her resignation in January of 2012 following the attempted assassination. Giffords was just the third woman to be elected to Congress from the state of Arizona. Prior to that, Giffords served in the Arizona House of Representatives from 2001 until 2003 and the Arizona State Senate from 2003 until 2005. Kelly was an American astronaut, retired US Navy Captain, and an experienced naval aviator who flew combat missions during the Gulf War. The winner of many awards, including the Legion of Merit, two Defense Superior Service Medals and two Distinguished Flying Crosses, Kelly was selected as an astronaut in 1996. He flew his first of four missions in 2001 aboard Space Shuttle Endeavour, the same space shuttle that he commanded on its final flight in May 2011. He has also commanded Space Shuttle Discovery and is one of only two individuals who have visited the International Space Station on four different occasions. In their New York Times best-selling memoir, Gabby, the couple shares their story of hope and resilience. Their story captivated the nation in an exclusive Diane Sawyer interview, Nightline and The Daily Show, as well as on the covers of People and USA Today. Kelly was featured on the cover of Esquire and named one of the magazine’s 2011 “Americans of the Year.” Kelly has also written two children’s books about the space explorations of a little mouse chosen for space missions, Mousetronaut: A Partially True Story, and Mousetronaut Goes to Mars. In 2013, on the second anniversary of the Tucson shooting, Kelly and Giffords launched a political action committee aimed at curbing gun violence. Now, as Gabby’s health continues to improve, the couple is sharing their remarkable story.